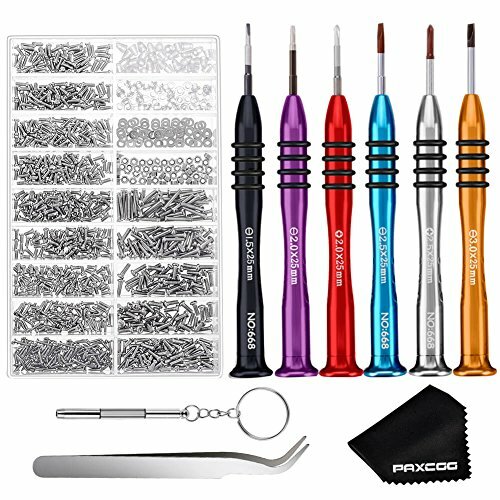 Paxcoo eyeglasses repair kit includes variety sizes of glass screws, magnetic eyeglasses screwdrivers, portable multi-function small screwdriver, tweezers and glasses cloth. A kit includes all you need to fix eyeglasses and sunglasses. The screws are packed in 18-grid transparent plastic box with size information on the cover. All the tools are kept in a custom case that looks neat and orderly. Please note that the small screws are made of stainless steel, not rusty iron. Therefore, the magnetic screwdriver is not strong in adsorbing these stainless steel screws. If you have any questions about this product by PAXCOO, contact us by completing and submitting the form below. If you are looking for a specif part number, please include it with your message.